When I got home, this is what was waiting for me, prepared by chef Jade herself. 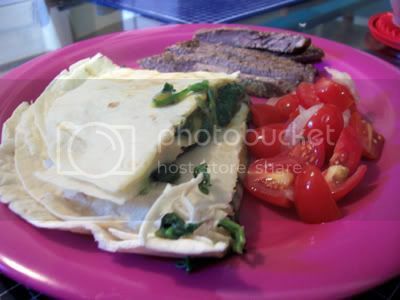 The main attraction is the spinach quesadilla which she paired up with sliced of grilled steak and some cherry tomatoes with slivers of sweet onions. It was a delicious lunch which was just perfect for filling my hunger but not making me too sleepy to go back to work. Making quesadilla is very easy and my girls learned how to make them early on, as soon as they were old enough to stand in front of the stove by themselves. Since then, they experiment on the fillings all the time, but of course plain cheese quesadilla is still a favorite. To make quesadilla’s, heat a skillet over medium heat and lay a tortilla on it (corn or flour, depending on which one you feel like eating or have in the ref), sprinkle with cheese and any additional topping which in this case is spinach. Try to get most of the liquids out of the spinach so your quesadilla doesn’t get soggy. Lay another piece of tortilla to cover, and heat until the cheese is starting to melt and the lower tortilla gets warmed through and slightly browned. Try not to burn it. Flip the tortillas and fillings over and let the other side warm and brown a bit. The slightly melted cheese will hold both tortillas together so flipping should not be too difficult. Try not to overfill so you won’t have any problems. When the cheese is melted and the tortillas warmed through, you’re ready to eat! awww! Jade is so sweet to prepare mom this meal! !